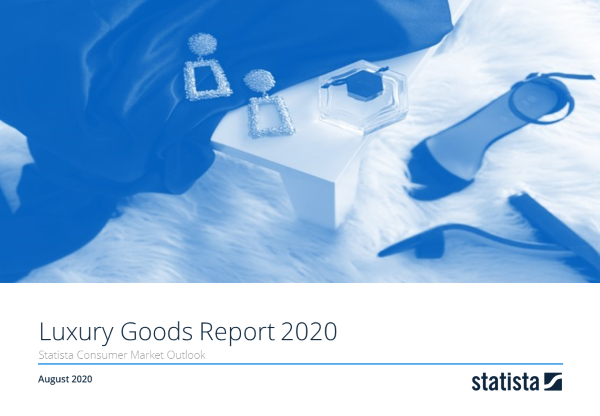 Revenue in the Luxury Goods market amounts to US$20,254m in 2019. The market is expected to grow annually by 2.2% (CAGR 2019-2023). The market's largest segment is the segment Luxury Fashion with a market volume of US$7,628m in 2019. In global comparison, most revenue is generated in United States (US$69,365m in 2019). In relation to total population figures, per person revenues of US$302.49 are generated in 2019. The conceptual key to understanding luxury in marketing is exclusivity. This exclusivity is maintained mainly by a high price point but also by consciously limiting sales volumes and outlets. In the Consumer Market Outlook, Luxury Goods encompass highly exclusive personal items that convey the taste and status of their owners. This includes Apparel, Footwear and Leather Accessories, Eyewear, as well as Watches and Jewelry, and Cosmetics. Data on luxury cars is not shown here but available in our mobility markets. The market data presented here is based on an analysis of the financial filings for the years 2010 to 2017 of more than 100 companies that target the luxury segments within the specified categories. The most important players are shown as part of the competitive landscape. A complete list of all companies covered can be found in the methodology description. Smaller companies (with revenues of less than 150 million US-Dollars per year) and artisanal production unaffiliated with the covered companies are not included in the data. All market and company share data always refer to the retail value (including sales taxes). Sales of licensed brands (especially important in the Eyewear and Cosmetics segments) are attributed to the licensee, so for example, Hugo Boss fragrances are counted as Coty sales to avoid double counting. Since reporting standards vary widely between companies, an array of estimation techniques has been employed to harmonize the reported key performance indicators with the market definitions employed here. Some of the most important indicators used in this process are shown at the bottom of the page. For example, among other indicators, the resident population of High Net Worth Individuals (abbreviated as HNWI, people with investible assets exceeding 1 million US-Dollars) has been used in combination with travel patterns (almost half of luxury purchases are made while traveling or in travel retail shops) to allocate sales geographically. 2017 witnessed a rebound of the global luxury goods industry after two relatively sluggish years. The outlook on a global scale remains positive, although regionally dimmed somewhat by uncertain economic prospects especially in the European markets as well as political instability in some emerging countries in Latin America, the Middle East and Africa. Greater China has returned to a sustained growth trajectory, which is nevertheless potentially vulnerable to possible shifts in the overall institutional framework. Key trends shaping the industry are a continued emphasis on manufacturer-owned retail, a more pronounced shift of sales from the established core markets in Western Europe, North America and Japan to Greater China and other emerging markets and a bigger role of the still underdeveloped eCommerce channel. Reading Support Revenue in the Luxury Goods market amounts to US$20,254m in 2019. Reading Support The Luxury Goods market is expected to show a revenue growth of 2.3% in 2020. Reading Support Products of brands held by LVMH amount to an estimated 12.0% of the Luxury Goods market in the selected segment and region in 2019. The “Revenue” box shows the forecasted development of the value of the selected market (market segment, region) at retail prices in millions of the selected currency for each year. Reading Support The average revenue per person in the market for Luxury Goods amounts to US$302.49 in 2019. Reading Support With a market volume of US$69,365m in 2019, most revenue is generated in United States. Here you can find more studies and statistics about "Luxury Goods".